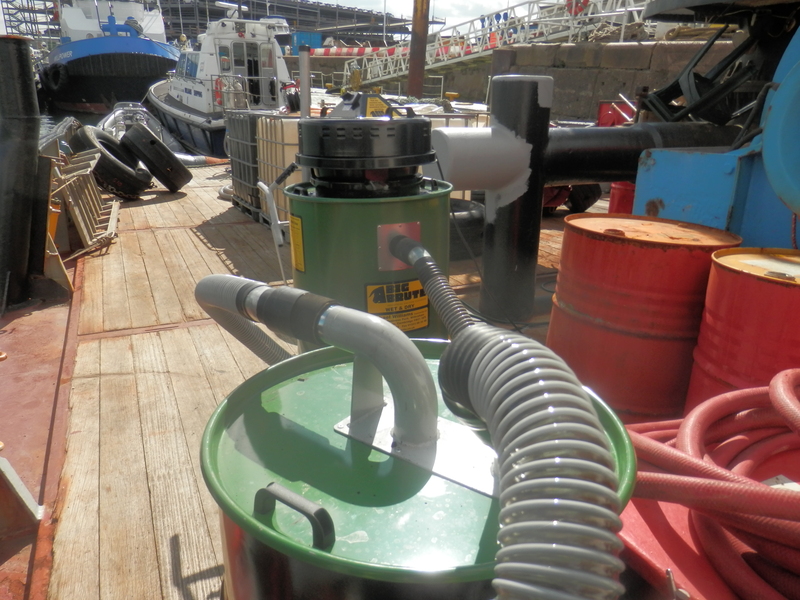 S D M Fuel Solutions Ltd is using the Big Brute’s powerful suction to clean out fuel tanks deep beneath the decks of ships and boats. S D M Fuel Solutions of Southampton provides tank cleaning as part of its comprehensive fuel management services. They were looking for a way to remove the sludge left in the bottom of fuel tanks once the fuel had been removed. They were using rags and paper towels to mop up the sludge. This was time-consuming, expensive and generated a lot of waste. Simon Mayne, the Director at S D M Fuel Solutions Ltd, was looking for a vacuum system that would help with his jobs. He originally found a company based in the USA offering what he was after, but then found the Big Brutes here in the UK. We discussed Simon’s application and suggested a Big Brute Wet & Dry with an Interceptor system. We also recommended longer suction hoses, as access into the bottom of the tanks is sometimes an issue. The Big Brute instantly performed admirably, helping Simon and his staff complete a job on a fuel tank 9 metres below deck. The Big Brute’s long hoses and powerful suction removed the sludge quickly and easily. Since purchasing their Big Brute, S D M Fuel Solutions Ltd complete jobs more quickly and have increased their volume of work. It’s also allowed them to take on more awkward jobs and complete them quickly and easily. S D M Fuel Solution Ltd’s website contains full details of their tank cleaning and fuel management services.